Yesterday, we shared our experience visiting Iguazu Falls, one of South America’s natural highlights. We covered the experience of the visit to the Falls, like most travel publications tend to do. After all, that’s why we all go up to this corner of the jungle. 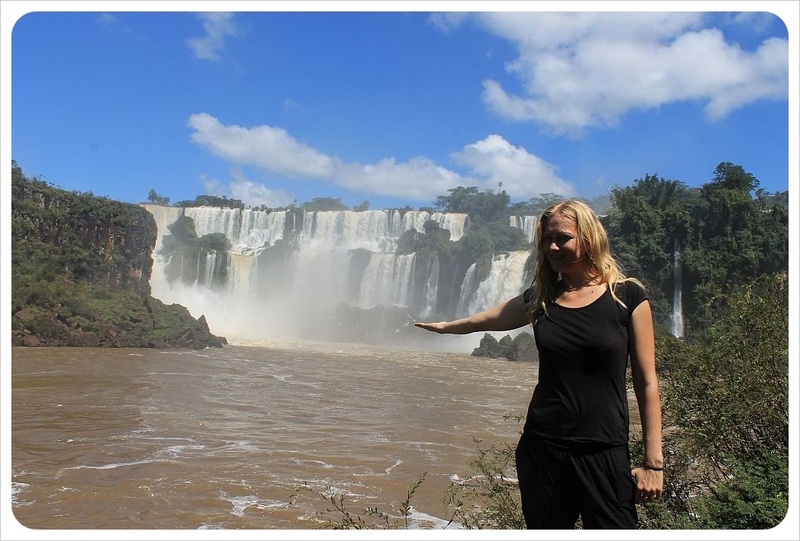 It was not cheap or easy to visit Iguazu Falls. Iguazu Falls are located on the border between Brazil and Argentina, out of the way of any other destination in either country. The only way the falls can be on the way anywhere is if you happen to be traveling overland through Paraguay (which most people aren’t). So likely you’re detouring to make a special trip here. Getting there is expensive. Buses are your cheapest option. On the Brazil side, Sao Paulo and Florianopolis, the closest biggest cities, are both just under 16 hours away by bus. From Buenos Aires it is a full 24-hour bus ride, and our trip from Rosario was 20 hours and cost ARS480, or $95 US dollars per ticket and our onward journey Puerto Iguazu to Salta was another ARS590, or $115 per person. This is one of the world’s major natural wonders, so there is obviously an airport. Buenos Aires is a two-hour flight, but flights are normally around $350 one way. Hotels and hostels have inflated rates, and even places with mediocre reviews are overpriced and quickly booked. We paid ARS245 / $48, for a double room in giant, mediocre hostel with carpet that may have not been vacuumed in years. Unless you are on a shoestring budget, we would recommend to choose a place with better reviews, but that will bump you up to more per night. Iguazu Falls admission rates are another extra cost on top. Per person we paid ARS60 / $12 for the bus to the Falls and back, plus ARS170 / $34 entrance and another ARS150 / US$30 for the boat ride – which we really recommend doing, too. So that is $76 total per person, plus Dani paid BRZ41.66 / $21 admission to visit the Brazilian side of the Falls, plus ARS8 / $1.60 for the bus to the border and ARS12 / US$2.40 (each way) from the border to the Falls. In total, the actual visit to the Falls cost us $181, and would have cost $210 had Jess come to the Brazilian side (plus an extra $140 for a 90-day visa that U.S. citizens must pay). Our tip: Don’t leave planning to the last minute. Booked in advance, a return flight from Buenos Aires could have cost under $400 – twice the price of a bus ticket, but saving you two entire days of your life on a not very comfortable bus. Another great option to save money is booking in advance a complete tour package with a local travel agency from Argentina. Consider a visit to the nearby historic Jesuit Missions in Paraguay, a UNESCO World Heritage site, while you are in the area. It’s a 4-hour trip from Puerto Iguazu, Argentina, by car (a little longer by bus). Considering that Puerto Iguazu is one of the most popular tourist destinations in Argentina, the town leaves much to be desired. Other popular tourist towns in Argentina – Bariloche, Cafayate, El Calafate, Ushuaia, are solid cities. They have great infrastructure for tourism and in general felt on par with similar places in Europe or the U.S. Puerto Iguazu feels much more like a developing country, only restaurants and souvenir shops line the streets, most hotels are in urgent need of renovation, and there were many child beggars walking barefoot from table to table all day throughout town.Our tip: Try to find a good deal for a nicer hotel on Booking.com or a hostel with excellent ratings on Hostelworld, and book well in advance. 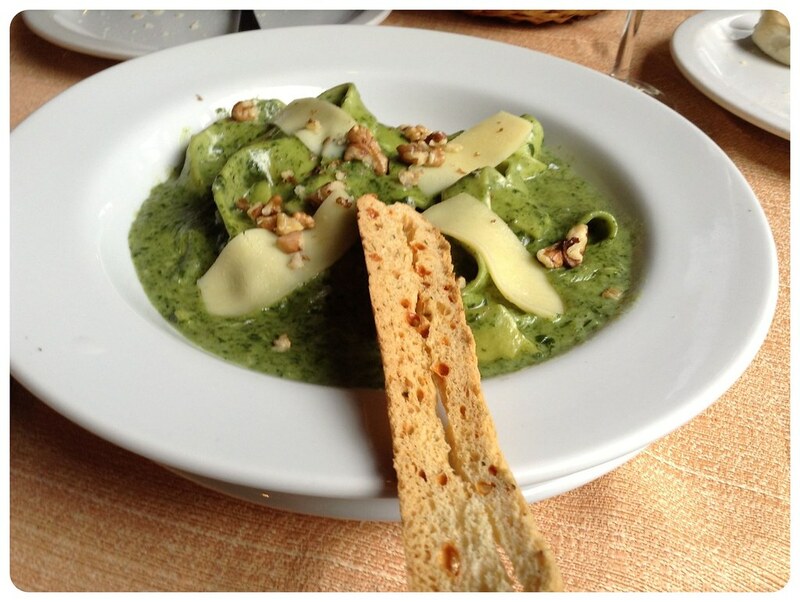 Splurge at some of the nicer restaurants – we loved La Rueda, an upscale restaurant on Avenida Córdoba 28. 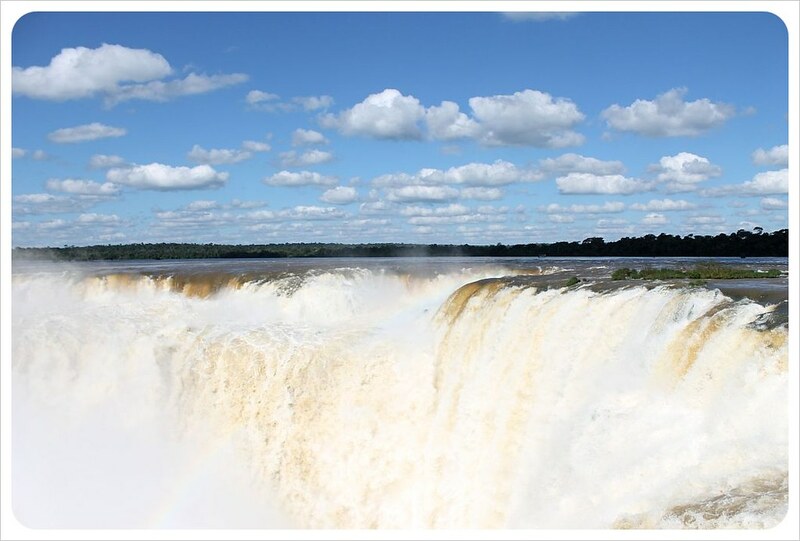 The good news is that since we stayed in Puerto Iguazu, a number of Airbnb’s have popped up on the Argentinian as well as the Brazlian side of the Falls! If you are not signed up with Airbnb yet, use my referral code to sign up and get up to $30 off your first booking. The real stars of Iguazu are not the Falls! Sure, the Falls are why we are all here and are by the far the most stunning aspect of your trip to the park. But you rarely hear about the coatis (a raccoon-like animal) that feel like the true main attraction. 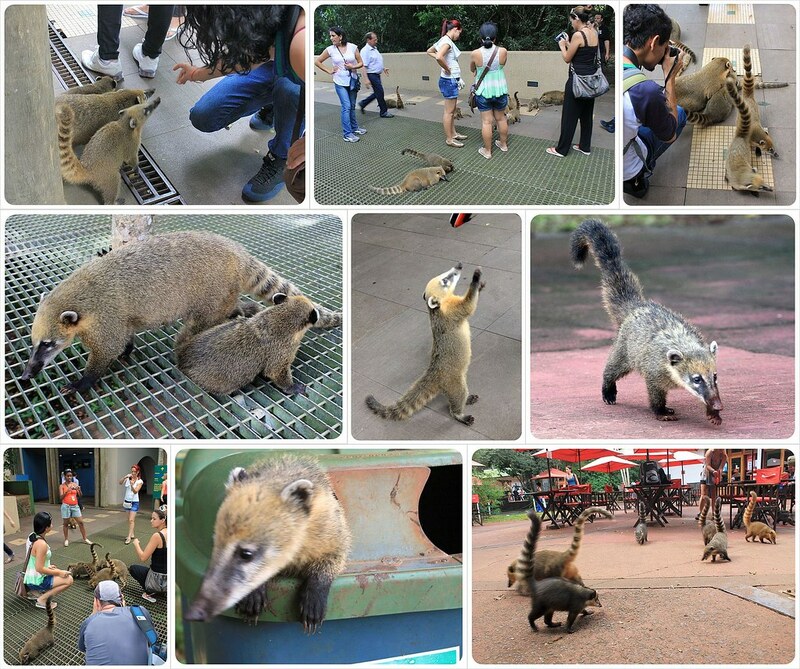 From the minute you pass through the gates, you’ll be met by dozens of coatis roaming freely. Tourists are constantly snapping pictures of them, possibly more than of the Falls. They kneel down and get so close to them – but don’t be fooled. These buggers BITE. They steal food, rummage through bags and depending on how many there are – they can get rather aggressive. 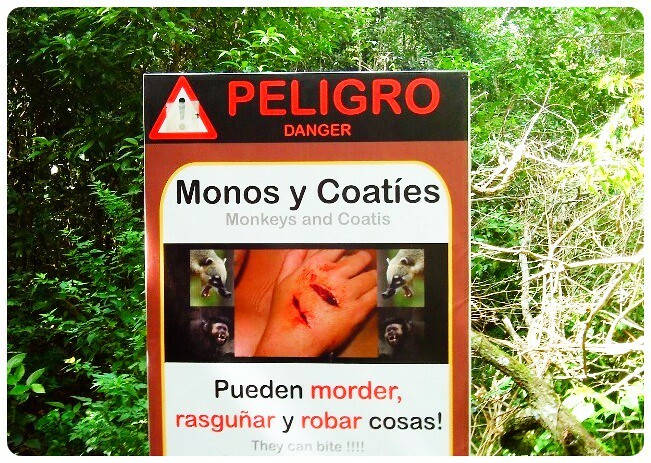 There are very large, very graphic warning signs showing what a coati bite looks like, but in true tourist mode, people from around the world still get frightening close to them, feed them or even pet them! Our tip: Don’t feed the coatis and keep a safe distance if you don’t want to pay for a rabies shot. If they smell food, they are likely to bite you. The nature around the Falls is spectacular. Staring at the Falls for hours, getting lost in imagining all that water rushing by your eyes every second – that’s the core reason you visit Iguazu Falls. But the wildlife here is amazing, and more than almost anything else, we’ll remember the butterflies, hundreds of them, fluttering around us as we wandered along the trails and through the gorgeous jungle here. There are colorful birds, huge catfish in the river, crocodiles, those pesky coatis and monkey and jaguars, (albeit the last two we didn’t personally see). Our tip: Take some time for a picnic – bring your own food, as the food in the park is overpriced and lackluster – and really take in the jungle scenery as well, not only the Falls. The National Park is huge! While the Brazilian side is pretty manageable with only one walkway (1.2 km long / 0.75 miles), the maze of walkways on the Argentine side is much bigger than we expected. While you can see Niagara Falls easily in a couple of hours, you can wander the walkways at Iguazu Falls for hours and hours. The upper trail, the lower trail, the trail on St Martin’s Island, the trail to the Devil’s Throat. If you’re also planning to take a boat ride, you can easily spend six hours in the park, especially as the little train ride from the entrance to the first set of trails takes a while, as does the train ride to the Devil’s Throat (Garganta Del Diablo). Our tip: Plan at least half a day for your visit to make sure you have enough time to walk all the trails, and have time to take in the falls from all the viewing platforms. We wouldn’t advise to attempt seeing the Brazilian side and the Argentine side in one day. Iguazu Falls are in a tropical region and it rains. A lot. Being in the densely humid jungle, it can rain hard for a few hours or a whole day. We saw plenty of package tourists trucking it out to the Falls the first two days we were in town because they had their one day and it was time to move on. Our tip: Err on the side of unpredictable tropical weather and give yourself a couple of days’ leeway so you can opt to go on the sunniest day possible. Trust us, the sun sparkling off the water, countless rainbows and all those butterflies make waiting a day or two totally worth it. Still looking for a place to stay in Puerto Iguazu? We spent 7 months in South & Central America last year and read I don’t know how many blogs and books. This is one of my favorite posts. Iguazu was early on in our adventures and we’d been wondering if places were actually kind of dumpy or if we were being snobs. We read your blog, spent a couple days in Iguazu and thought to ourselves, “nope, some places are kind of gross” – – and you were spot on with the rest of your tips too. It’s not often that bloggers are so dang accurate. Nicely done! Hi! Just visited (Jan 2016) both side of falls and the entrancefees and bustickets are nowadays double than 2013. Argentina side entrance was 300 pesos and bus ticket from busstation to back was 130 pesos. Entrance fee to Brazil side was 63,50 reales. Martina – thanks so much for the updated info! Helps so much! I’ll incorporate it into the article when I update it. I stayed on the Argentinian side but didn’t love it – maybe the Brazilian side has better accommodation options? And yes, you do need a visa – US citizens used to have to pay $160 (reciprocity visa fee) but I know it was suspended last year for a while.. not sure if it still is? 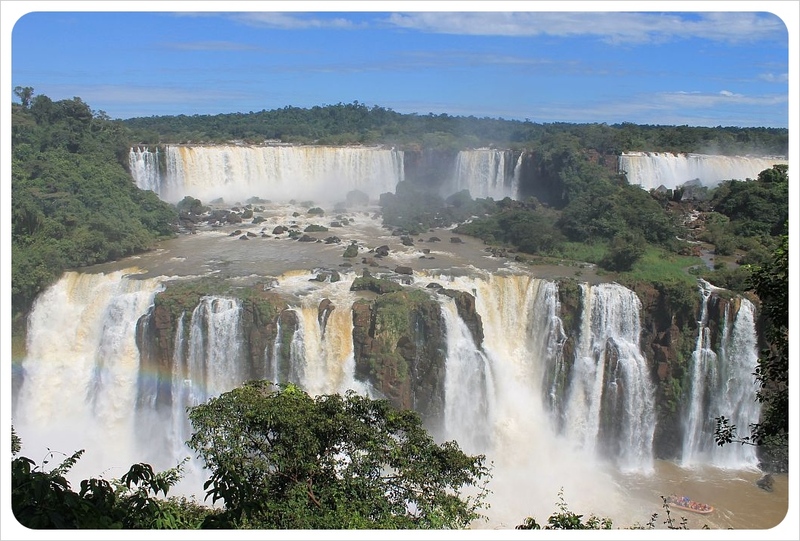 I was glad that I did both though – while Brazil was great for panoramic vistas, you couldn’t get as close to the big waterfalls there as you could on the Argentinian side. From what I’ve read, this journey will take you 7 or 8 hours or more, travelling via Posadas and Encarnacion to Trinidad. Is there a shorter way, via Paraguay perhaps? Jelle, you’re right, two hours is not correct! I gotta correct this. It’s 4 hours by car, or you can take the bus down to San Ignacio (3 hrs 15 mins) and continue on via Posadas to cross into Paraguay there. Here’s a Lonely Planet discussion with someone advising who made the trip. Great blog. I keep hearing that it’s unwise to try and book a flight out of the Falls on the same day we’re returning to the states; 9:00pm flight, due to delays or cancelations. Do you have any knowledge of this? Hi Judy, that’s weird! 🙁 Have you still not heard back from them? 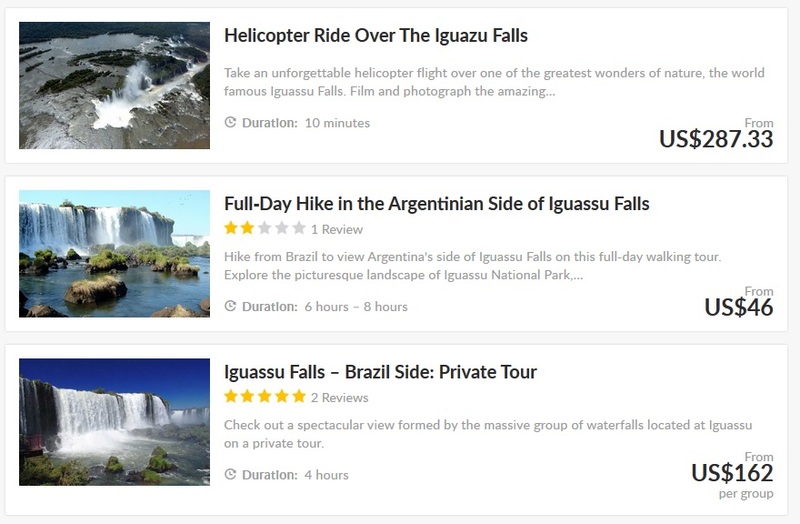 Maybe it’s because you’re looking for a tailored trip to Iguazu AND Salta – I think the only tours they offer are from Buenos Aires to Iguazu. I took a direct bus from Iguazu to Salta though, which was comfortable and easy. Judy, just seeing your post and can HIGHLY recommend 01Argentine Travel Agency – I was looking on this site a year ago for advice about Argentina, booked my trip through them and it was absolutely brilliant, trouble-free, really interesting – went to Buenos Aires, Patagonia (El Calafate), Iguazu – Pablo was AMAZING, the best tour operator I’ve ever encountered….. now back on this site for tips about Namibia! I am planning a trip to Argentina for two weeks in early January 2018. 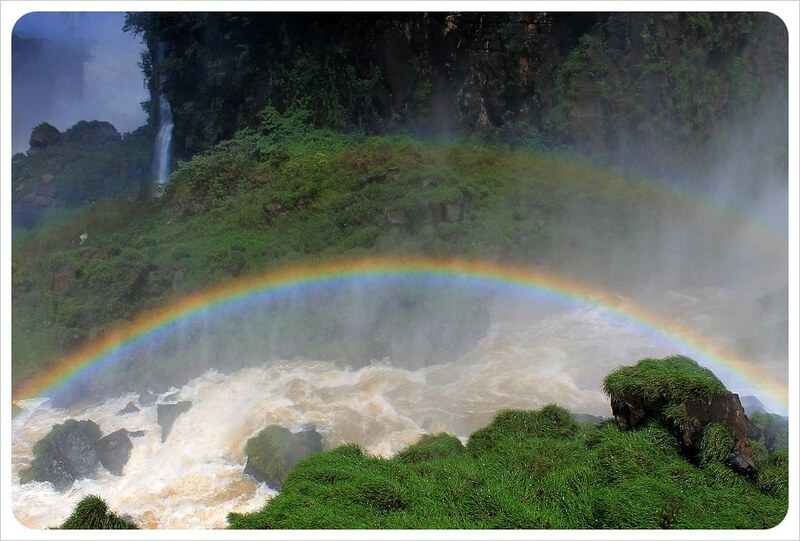 How many days should we plan to go to Iguazu? I love butterflies. Are are any interesting places in Argentina you can tell us? HI Dani! Thanks for your tips! Planning the 2,5 days trip to Iguazu, Argentina. I’m going alone and interested in either to meet new people or have a relaxing time. 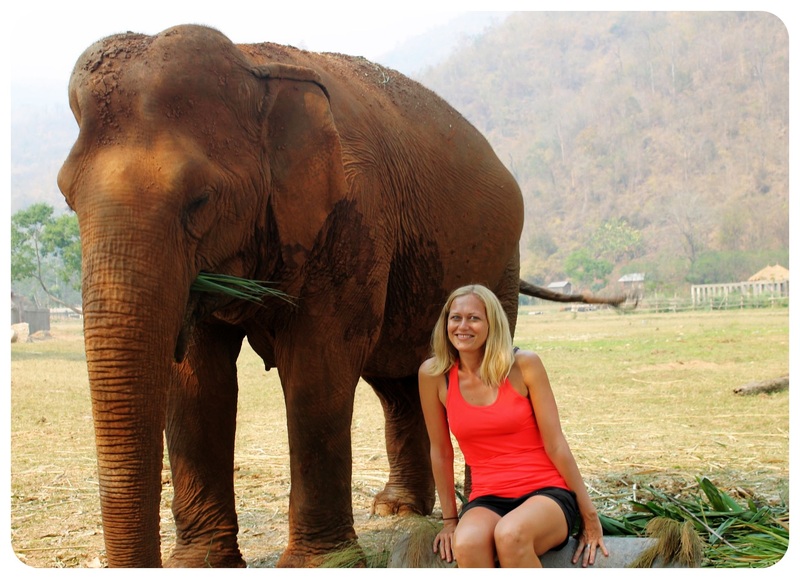 Could you advise if it is better to book a hotel in the downtown or deep in jungle? Are the pools, spa good there? Totally lost thinking about the best place to stay for 2 nights… Thanks! 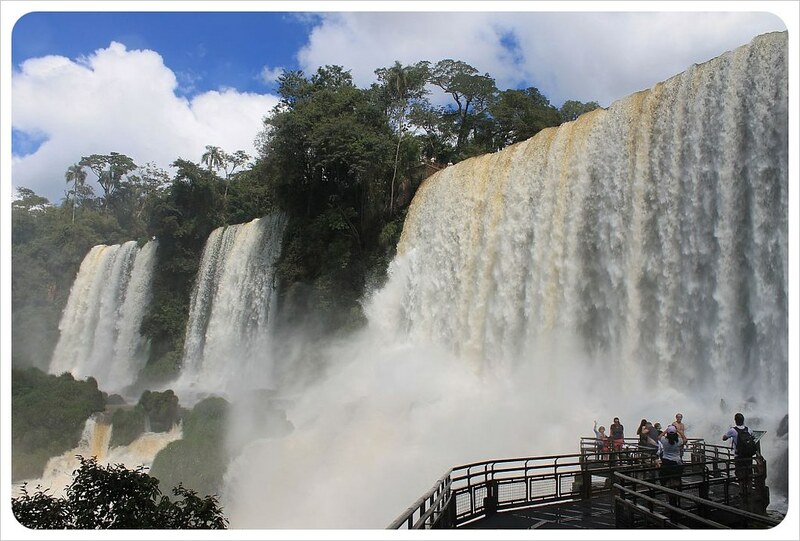 Just wondering how to get from our lodging in Puerto Iguazu into the park? Is there a bus or do you have to hire a driver? I understand there is a train to get around once we are in the park. Hi Kevin, there are buses that run all the time (every 20 or 30 mins) – no need to take a taxi 🙂 Enjoy the Falls! 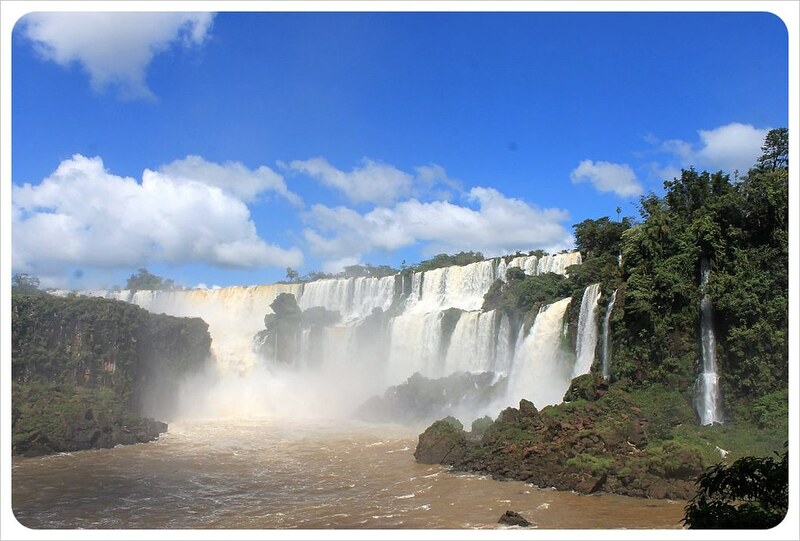 I am going to be at Iguazu Argentina in a few weeks. What do you reccomend in terms of footwear, clothing, and waterproof items (eg raincoat vs poncho)? 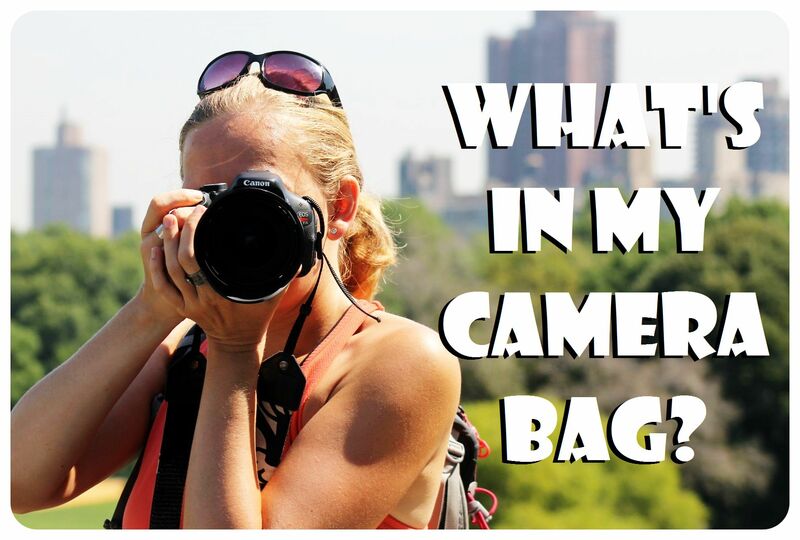 How did you keep your camera dry too? We are flying in to the Argentine side. What is the best way to get to the Falls? We are flying out the same way so going straight to the falls and straight back to the airport is what we are looking for. 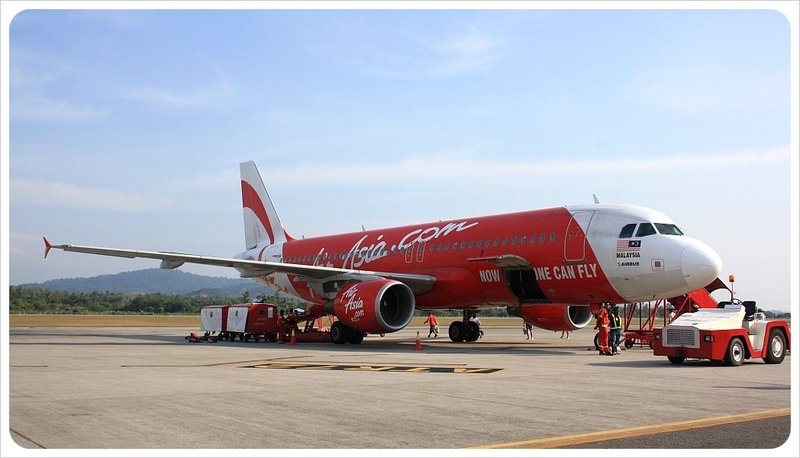 Are there cabs waiting at the airport or should we pre-book a shuttle? Any recommendations? We booked a tours by local guide for 4 days when we went. He picked us up at airport, enquired of our supper plan. We had none, he brought us to a really good local show with fantastic bbq buffet. As a former park employee on Brazil side and photographer he knew where to drop us for great shots. He suggested bird sanctuary before the falls. Having guide was great because we overnighted on both sides he pu/dropped at hotels. Because we had great weather he extended our trip to Wanda mines and dropped at airport. Took us to a Yerba plantation went out of his way to show us non-Rio Brazil. His name is Francis in the tours by local web site for the falls. And like all guides is licensed tour guide. Thanks for the post, needs some updates to save the broken images though! Also I’m not sure if you’d want to promote this, but at least in 2016 it was possible (easy) to get smuggled over the border in a taxi, as they don’t really check documents at the Brazilian-Argentine border, and they do not check documents -at all- on the Paraguay-Brazil border (it’s like Schengen there). I doubt this has changed, although it’s now much easier for US citizens to get a Brazil visa, even if it’s still $$$. Thanks for the post. Concering the price changes: Have you considered that along with the different $-Pesos rate they adjusted prices as well? I somehow have my doubts that it got much cheaper over the years. Trust me, the exchange rate makes a huge difference. Price adjustment is much smaller than the rapid change of the exchange rate, especially of the Argentine peso. I met people who went to Iguazu Falls a couple of years after I went and paid half of what I paid. Are the mosquitoes a serious problem…..yellow fever concerns. Hi Kay, I didn’t feel like they were much of a problem. Just use some mosquito repellent and you’ll be fine.